Just when you thought it would never be over – it is finally the weekend! Time to get your groove on to all the best new tunes. 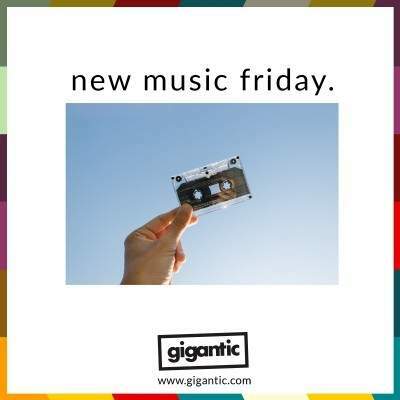 Gigantic is here with the perfect soundtrack to your days off with our #NewMusicFriday playlist. Not only do we bring you a comprehensive list of all the recent releases you need to know plus all the essential facts, but you can also book to see your favourite new act perform live. Turn up the volume and keep scrolling! Yesterday saw the release of Scottish song writing supremo James Yorkston new single ‘My Mouth Ain’t No Bible’. Starting off with a building drum roll, his latest offering sees Yorkston unleash a poetic stream of consciousness which examines the many degrees of his anxieties and passions. ‘My Mouth Ain’t No Bible’ will feature on forthcoming album ‘The Route To Harmonium’ which is expected to be released on Friday 22nd of February and is a summarisation of Yorkston’s life experiences and the tribulations of being on tour. Catch James Yorkston when he plays his new material at Islington Assembly Hall on Tuesday 7th of May next year. James Yorkston tickets are currently available. Coming hot on the heels of his recently released album ‘Age Of’, experimental Massachusetts producer Daniel Lopatin better known as Oneohtrix Point Never releases his new EP ‘Love In The Time Of Lexarpo’ which includes a remix taken from the LP of ‘Last Known Image Of A Song’ by electronic legend Ryuichi Sakamoto. Sticking with Warp Records, the new four-track record is a blissful haze of ambient noise and deep treks into sonic soundscapes, with the occasional use of acoustic instruments here and there is even a contribution from (Sandy) Alex G at the end. Oneohtrix Point Never tickets are currently available. First formed in 1995 by Grammy-nominated ace producer Simon Emmerson, Afro Celt Sound System enjoy the support of a devoted following, drawn to their unique fusion of Afrobeat, Celtic folk influences and electronica which has seen them reach worldwide sales of over one and a half million records. Today sees the release of their highly acclaimed new album ‘Flight’ which is thirteen-tracks of wonderfully eclectic and uplifting ground-breaking music which explores what it is to be a refugee including the need to escape, the pains of the journey and to eventually find a new home. Inspiration for the record draws heavily from band members Ríoghnach Connolly and Simon Emmerson’s work with the refugee communities of Manchester and the wider North West region. ‘Flight’ was recorded over many sessions and used over thirteen studios located across African and Europe, with executive producer Mark Constantine overseeing the ambitious project and artwork provided by founding member Jamie Reid. Afro Celt Sound System tickets are currently available. Rejoice, because art student favourites Art Brut are back! Seven years since the release of their last LP, they make their welcome comeback with new album ‘Wham! Bang! Pow! Let’s Rock Out!’ which is a whole load of bouncy indie pop fun. ‘Wham! Bang! Pow! Let’s Rock Out!’ includes the singles ‘Hospital!’ which appears to be a wry comment on Argos’ recent health problems and titular single ‘Wham! Bang! Pow! Let’s Rock Out!’ which lists the pleasures and the pitfalls of every house party. Art Brut tickets are currently available.